A disgruntled chap who may or may not be a gfsa member was selling an unfinished project, its an ibby RG7321 and comes with a hardcase. I put in an offer for just over a grand and now it is mine, it is still on its way to me but I have some pics of the unfinished job. I feel bad for the guy as he said that he was so angry with himself for botching the paint work. Looking at the pics it is very thick paint, ideally I want to try and strip away the neck and try get to the wood under there. Any tips? It's spray paint apparently so would paint stripper be an option? 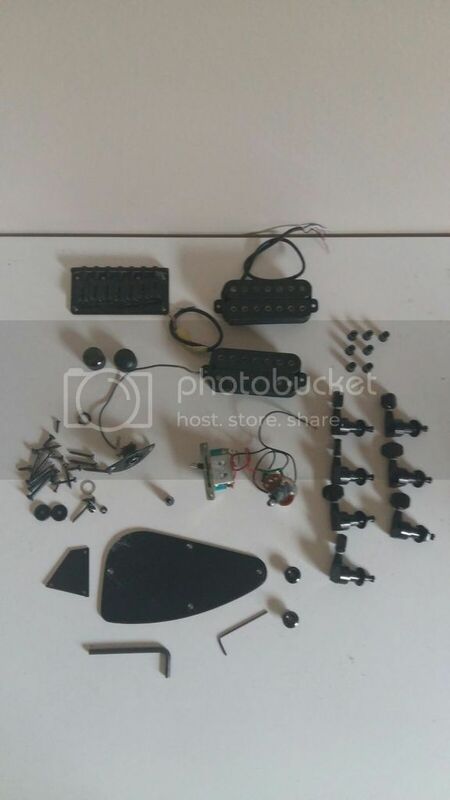 Here are the pics, hope im not an idiot for just jumping in on the purchase but a 7 string project is right up my alley at the moment. Tips and suggestions welcome !! Before starting a stripping job, I'd test fit all the bits together, string it up and check it's a player (is the neck straight, trem works, all parts present etc...). Might be a bit painful (I see it's thru strung, meaning fitting and removing the ferrules), but you don't know what other headache you may have inherited? Yeah I see now it is a lot of work to do, but I'm up for the challenge I think. The previous owner said that when he bought it it had already been sprayed a terrible flame job of the body, so I may just smooth this base coat out and use it as a primer, I'm looking more to sort out the neck than anything else. I can't find a decent 7 string anywhere for under 3 grand so I figure what the heck, might as well jump in. 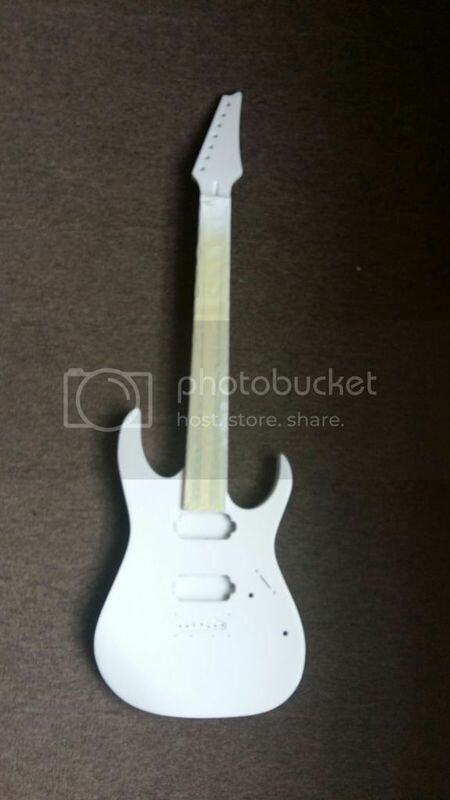 Apparently the guitar was a decent player before DIY enthusiast number 2 decided to spray it white. Whoever the bright spark was that painted the flames also removed the tone pot, meaning I will have to source another one. So basic plan of attack will be, fit everything together, check it's all there, check it is playable. Tear it down, sort out the body and spray the original colour, paint strip and sand the neck and pray that the serial number is still under there somewhere. 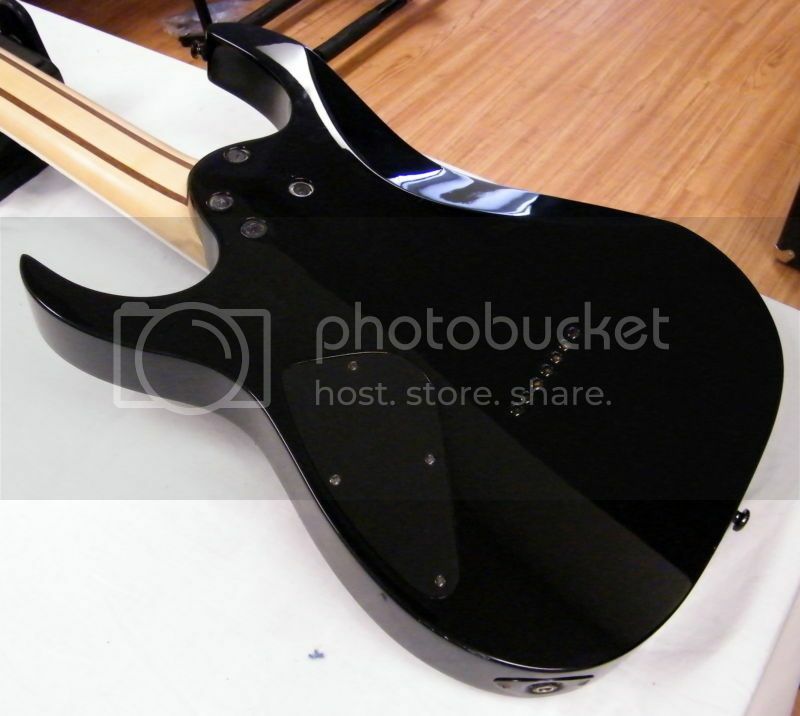 ( He sent me a photo of it at least, its a 2004 model.... spray the headstock and stick a decal on there. Good idea! I was thinking of using the white as a base coat for your finish as well. 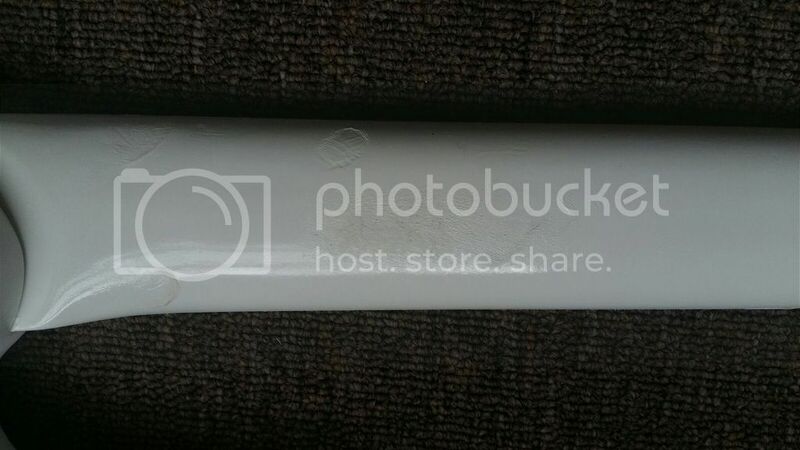 As a aside, I recall Chocklit_Thunder was asking about waterslide decals as well recently on SA Music Store - someone mentioned where he could find the paper locally so he could do his own, instead of having to import a decal from the US. Maybe PM him for more details (or poke him on facebook). Good luck on this one G-Man. 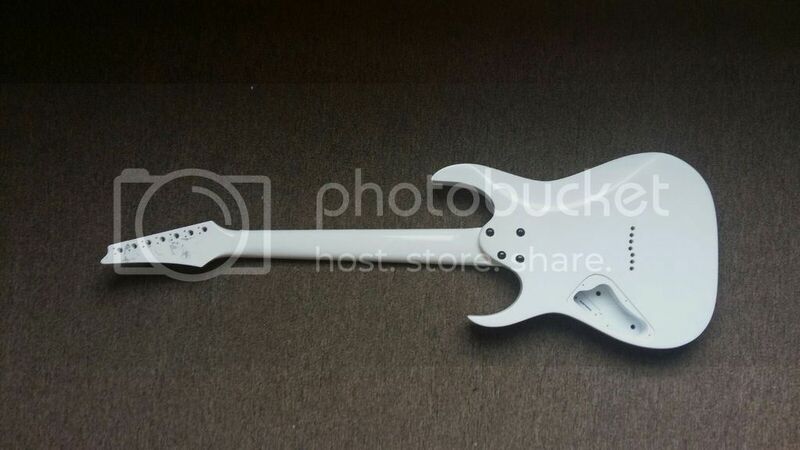 Actually looks like a nice guitar, I can see why you wanted it, but personally me and project guitars have a love/hate relationship, and it always ends in tears. Good luck, keep us posted. Out of curiosity, you bought this from Gerhardt? Sweet, though I am seriously considering out-sourcing this one. I did some digging through the paint, there's at least four layers. That's gonna be fun to strip. Not. If it were up to me I'd leave it as is, but the gear junkies tell me that I must do something else with the finish. And a new body isn't a option - it's that hofner 189 bass I got a month or so ago and it's rarer than rare (not valuable, just rare) - worth refinishing...I guess. V8 wrote: Out of curiosity, you bought this from Gerhardt? 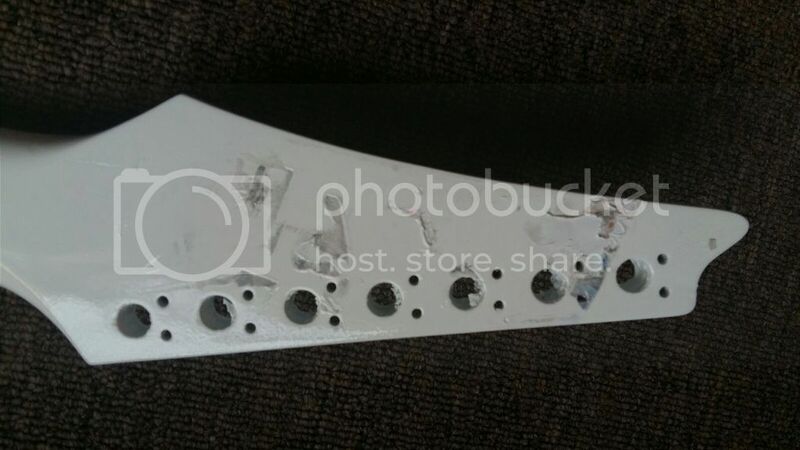 I found another rg7321 and I see it's ferrules are straight but mine are kind of staggered? Is this dependant on the bridge? I know they in JHB (its seems also bloem and CPT) which is a distance from you, but I also battled to find it and these guys were the only place I could find that sold it. You print the design onto the paper and transfer it onto your surface. Works well. Good luck with the project and keep us posted. 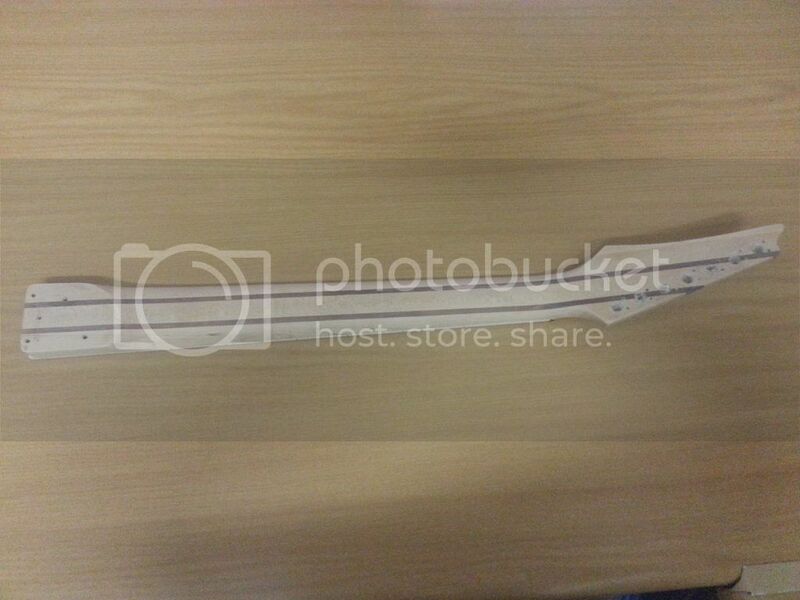 There's was a guy called Zane Jacobs try admin@zane.co.za , he specialized in model decals and did stellar work. If I remember correctly he used to do guitar stuff for Andy McGibbons. PE BAsed. He has one of those special printers that prints white. Please don't do what I did and follow some online tutorial about creating your own decals with transparency paper. It should all work in theory but the result is very angle based. Hold it up like this... looks great, but if the light catches it wrong its just a dull spot on the neck. Live and learn my man. If you don't f(*& it up some how along the way, you are not learning anything. 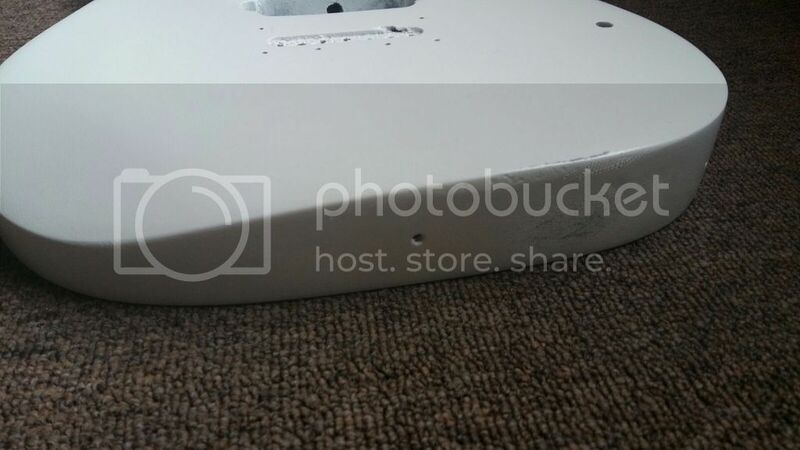 So I started stripping the neck and have taken some pics. 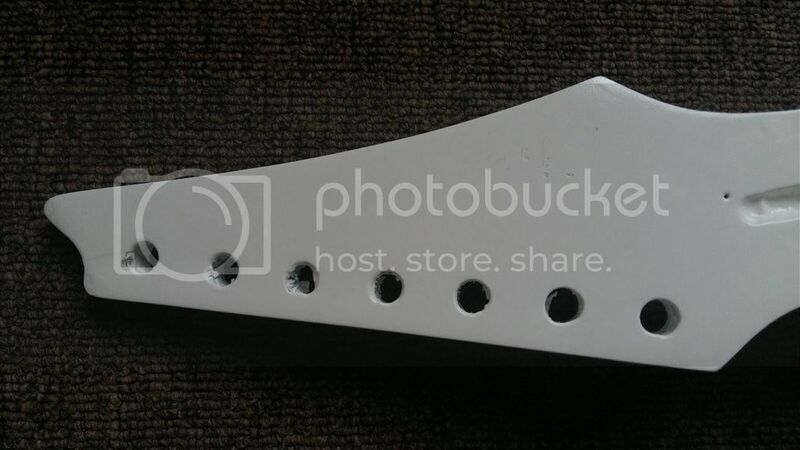 What would you guys recommend for the headstock? Think it will look cool if I left it with the natural finish and just applied a transparent decal or should I spray it the same colour as the body once that has been decided? Was going to use the white as a base coat but it was a pretty uneven spray job, and only one thick coat as it turned out. Still trying to figure out what the hell the previous owners were trying to do here. Matching colour headstocks associate with cheap guitars to me, the six piece neck looks more than good enough to go clear lacquer. My psyche tends to think that paint is there to hide something. I support Gearhead's clear lacquer proposal. 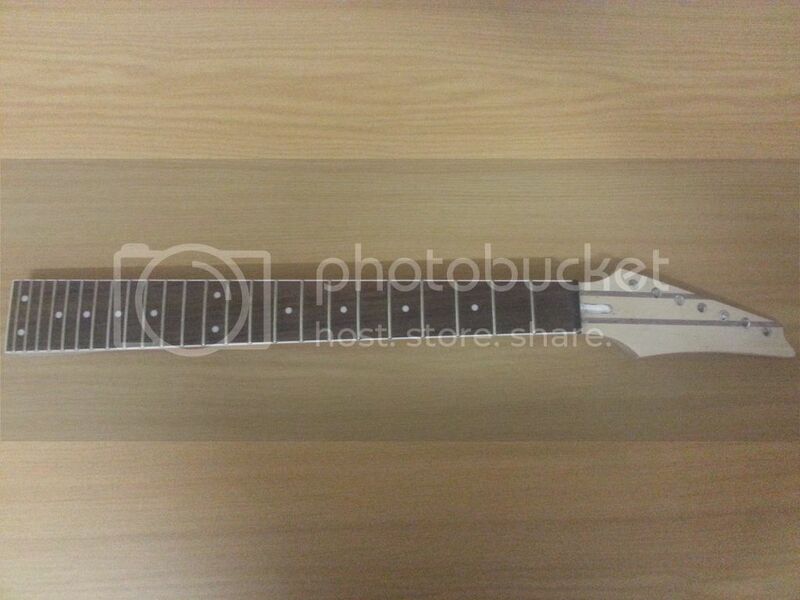 Im going to start looking for some decal ideas for the headstock but now some other things to consider. Would oiling the neck be sufficient as I have used boiled linseed oil previously on my bass build. I never did put a clear coat over it I just applied as many coats of oil as the wood could take. Or should I rather just spray the clear as is? Lots and lots of options. I have been toying with the idea of stripping the body and just leaving in natural but it looks like lots of hard work.